Witch Doctors are nothing but trouble, always. That’s one of the principal lessons that you’ll quickly pick up as you take your first, stumbling steps into the fog-shrouded, Mystery Island-like setting of Aegrus. 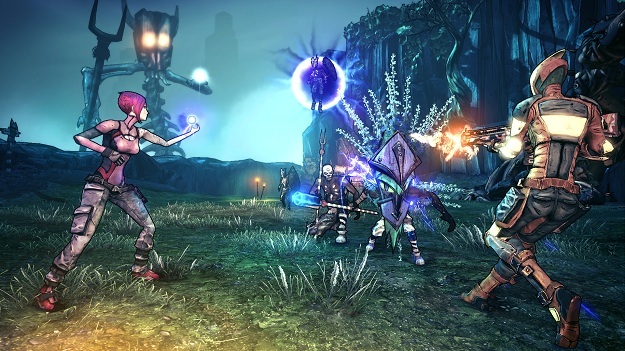 The Pandoran continent is introduced for the first time in Sir Hammerlock’s Big Game Hunt, the third of four announced content packs that Gearbox Software has in the works for Borderlands 2. This next DLC drop arrives on January 15, 2013, and while it will probably come before the now-confirmed boosted level cap and third playthrough option, there’s still plenty for players with hundred of invested hours to look forward to. Big Game Hunt is designed for late-game play. In fact, the new story makes the assumption that you’ve defeated Handsome Jack and it even functions as a sort of disconnected epilogue for the main game’s events. What starts out as a brotastic hunting trip with the titular Monty Python cast-off quickly spirals into something much bigger. There’s a Handsome Jack superfan stirring up trouble in Aegrus, and there’s no one better equipped than the Vault Hunter (or Vault Hunters, for you co-oppers) to stop him. I’ve actually had an opportunity now to play through the full Sir Hammerlock story and sample some of its secondary tasks. Not enough for a review, but more than enough to share a taste of this new Pandoran landscape. We’ll leave main questline content and sidequests for future review coverage and instead spend today focusing on Aegrus. The massive Aegran landscape is meant to be reminiscent in some ways of King Kong‘s Mystery Island. A thick layer of fog seems to blanket everything. It’s never enough to obscure your vision, but the fog is ubiquitous enough to reinforce the sense that you’re treading through unexplored lands. The mixture of mountains and swamps stretches out over vast distances, with the main Hunter’s Grotto area almost certainly larger than any other Borderlands 2 environment we’ve encountered so far. Overall, the landscapes are all gorgeous and feel markedly different than anything in the main game or subsequent DLC drops. The flat stretches of swampland provide a great opportunity as well to check out the new fan boat vehicle. Fan boats are unlocked early, and with little fanfare, as part of the main questline. 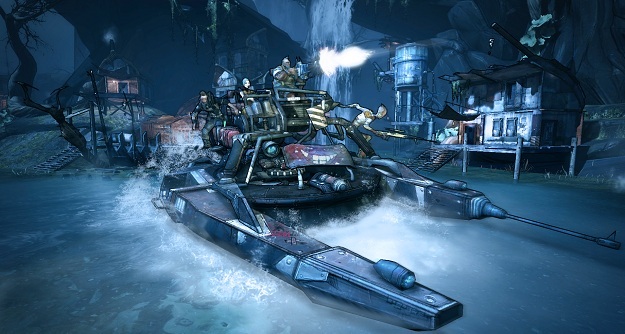 The vehicle handles similarly to the Scarlett DLC’s sand skiff in that it can strafe, and its secondary turret weapon can be fitted with any of three status effect-inducing weapons. Shock and corrosive bombs fire slowly and travel in lazy arcs to their destination. There’s also a flamethrower weapon that offers a significantly reduced attack range in exchange for a higher damage output. Going along with the new lands is a surprisingly wide assortment of new enemies standing in your way. There are a handful of re-skinned creatures, such as the Borok’s clearly re-skinned Stalker. The oversized, spider-like Drifters are also back now, revived from the previous game. Scorpion-like Scaylions and an array of tribal Savages bring in some entirely new twists, particularly in the case of the latter. Savages come in multiple melee and ranged varieties, but the most dangerous among them is, without a doubt, the Witch Doctor. Witch Doctors are support characters with a moderately damaging ranged attack and a temporary invincibility buff during which they zip around the battlefield while taking the form of a cyclone or a colony of bats. Their direct damage attacks are something to watch out for, but it’s their support ability that makes them priority number one in any encounter. See, Witch Doctors all possess the ability to level up their allies, much like a Goliath does when you shoot its helmet off. The difference is, when a Witch Doctor takes the field, it’s only a matter of time before he starts leveling up Savage Hunters to Skilled Hunters and then Blood Hunters. What’s more, Witch Doctors generally come packing a high HP total and some level of damage resistance. They are tough to bring down, and even tougher when they start appearing in Super Badass and Ultimate Badass varieties. In addition to being able to level allies, Witch Doctors can also heal themselves and others. Some bring additional combat options as well. A Paralyzing Witch Doctor, for example, can slow your movement speed to a crawl when it locks you in its beam. A Devil Witch Doctor will drain your health and fire off salvos of fireballs. Savages seem to be the most common enemy that you’ll encounter in Aegrus. This is a great thing if you’re a diehard Borderlands 2 player, as you’re forced to devise a whole new set of strategies for tackling them in larger groups. One particular challenge in this DLC — that ultimately leads to the unlocking of a Vermivorous-like “Invincible” boss (not a Seraph guardian, though there’s one of those too) — will test even the best four-player parties. So much so that the Invincible boss you get to fight afterward feels like easier prey by a significant margin. 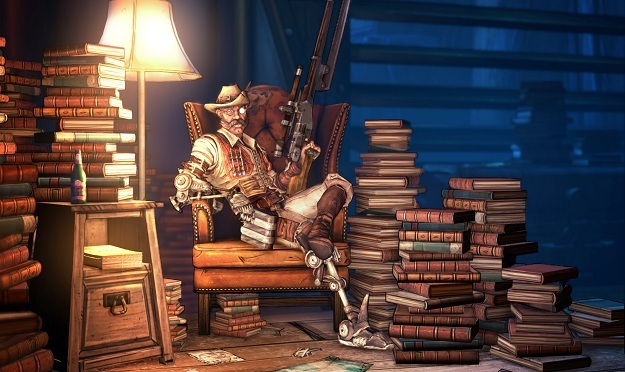 After the big, fat pile of missed opportunities that Mr. Torgue’s Campaign of Carnage threw in players’ faces, it seems that Gearbox is back to its old habits of surprising fans with compelling new content that carries the flavor of Borderlands while also offering something decidedly new and different. I’ve still got plenty more to absorb in Sir Hammerlock’s Big Game Hunt — including that pesky new Seraph Guardian — but my impressions of the first few hours are most definitely positive. Look for the DLC to launch is just under a month from now, on January 15, 2013.